“They will come to know that India cannot be run by two or three people,” says the Congress president. 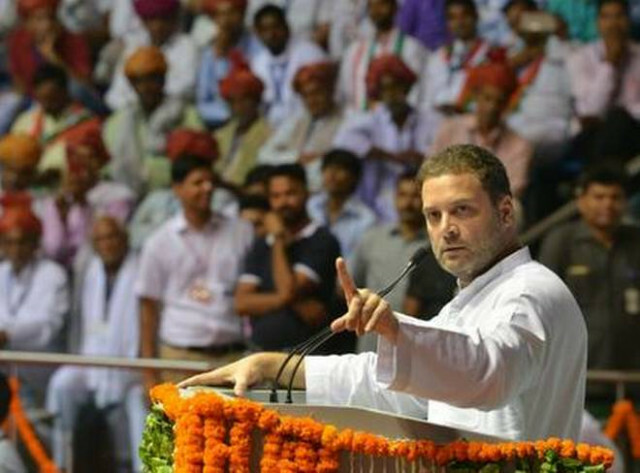 Congress president Rahul Gandhi on Monday alleged that “the country has now become a slave to two-three top people in the BJP and the RSS” and asserted that a united Opposition will fight back effectively. Mr. Gandhi was speaking at the first-ever convention of the party’ Other Backward Classes (OBC) wing at Delhi’s Talkatora indoor stadium. “In a way, today the country has become a slave to three-four top people of the BJP and the RSS. That’s why you will see the entire Opposition in the next six to eight months to a year get together and show India’s power,” said Mr. Gandhi. “They will come to know that India cannot be run by two or three people,” he added. Having lost out to regional leaders like Mulayam Singh Yadav and Lalu Prasad Yadav who built a dedicated vote bank in the 90s, the Congress is now keen to tap the OBCs that form over 52% of the population. The Congress president promised better representation of OBCs in the party at every level, including Lok Sabha and Assemblies. Mr. Gandhi claimed that his government has not only ignored the interests of farmers but also has helped a small group of industrialists by waiving loans amounting to nearly ₹2.5 lakh crore. “₹2.5 lakh crore were given to 15 industrialists. But the farmer got nothing... the loan waiver was for 15 people, but not for the farmer who continues to commit suicide... his children keep crying,” Mr. Gandhi said. Mr. Gandhi claimed that the non-performing assets of banks have gone up to ₹1,000 crore. “People with skills are not rewarded in India... farmers work hard, but you don’t see them in the office of Modi ji,” he said. He also challenged the stand of the government that India lacks skills, saying it was not true and the authorities have failed to recognise the fact.